I have a secret: I collect garden gnomes. It likely started when my friends and I took one from someone's lawn in high school as a prank. If you're reading this, sorry I took your gnome. The gag grew into a running joke and people started giving them to me as gifts. Altogether I've probably got about 17 scattered throughout my house and photographing them is on my list of things to do. They all have names and my mom and I joke about their personalities based on what their faces look like. The first time I saw Amelie a few months ago, I got so excited about the gnome I was practically jumping up and down checking out the collection to see if there was one that looked like her father's. Gnomes, man. Love them. Today I put on my outfit and was so pleased and excited with it in a way I haven't been in weeks. The Tokyo Forest-girl style was floating around in the back of my mind and came through in the autumnal colors. 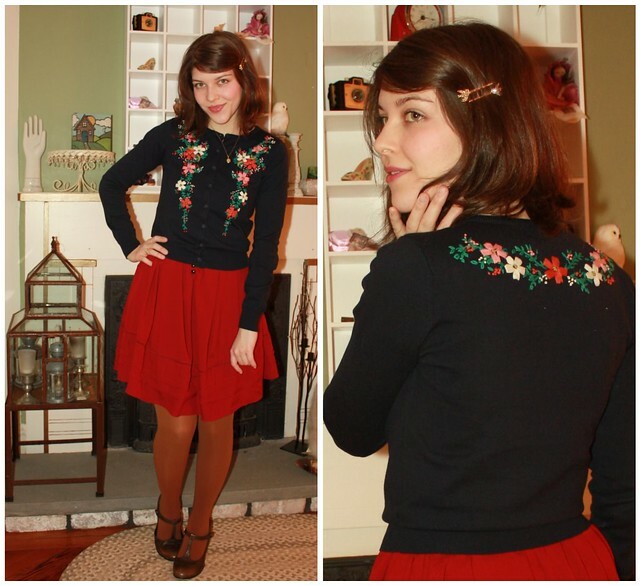 My gorgeous floral-embroidered sweater was hanging in my mom's closet for too long so I adopted it and wore it for the first time. This outfit made me smile all day, and I couldn't figure out why. While I was taking pictures I realized that the colors corresponded perfectly with garden gnome attire! Yes, I own the gnome in a box. His name is Geoff, and he doesn't get out enough. geoff is my favorite name, perfect for that adorable gnome ;) your outfit here is so sweet! lovely photos! It is excellently gnomish! I remember I once had plans to get a gnome put on a t-shirt at one of those places that does that, but it never happened. Still seems like a good idea though! 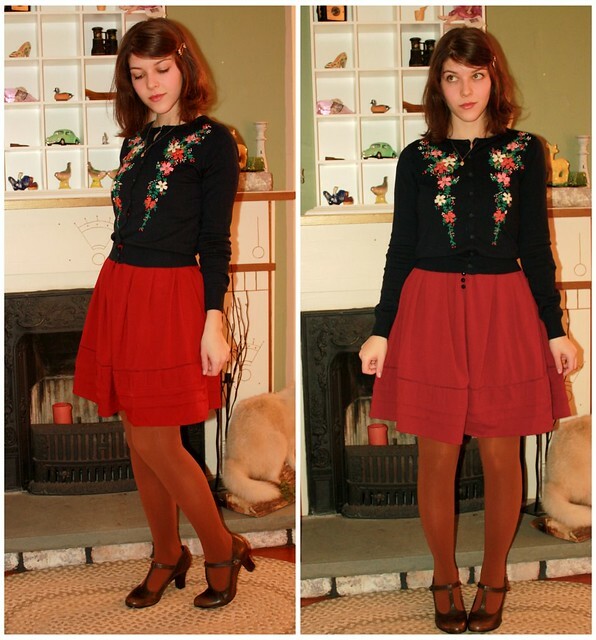 I love the swiss-milkmaid style floral and colour blocking going on here; it's a really fun outfit! 17?! And they have names?! How wicked cool! Thanks for the comment :) Absolutely love the cardigan, I think I would've borrowed it from my mum if it was languishing sadly! The reds and oranges are very gnome-y indeed, poor Geoff, maybe you should take him out and about with you like in Amelie. also, your house is amazing looking. 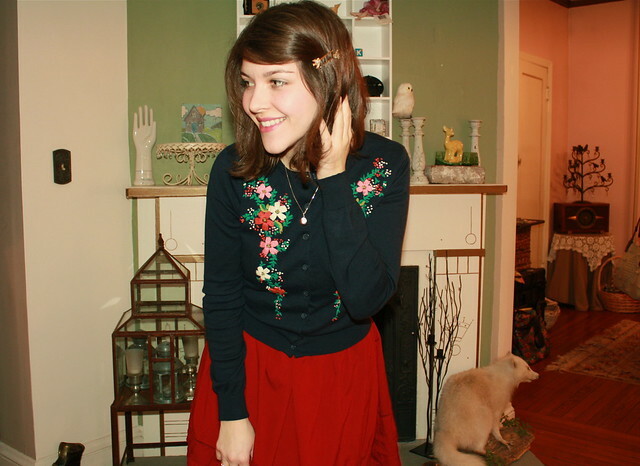 Cute outfit - I love the embroidery on the cardigan. It's so much fun to hear about all the neat stuff that other people collect (for me it's Hello Kitty junk, cameos, and tiaras). i love this cardigan - i can't believe i didn't buy it when i saw it at forever21. it looks like vintage! very pretty outfit. OMG after watching Le fabuleux destin d'Amélie Poulain i wanted to own a gnome and have him travel with me.. :D have you seen that movie? Garden gnomes are such a unique thing to collect. How fun! I traveled through a town this summer that was invested with garden gnomes. Everyone in town was obsessed with them!! I really enjoy the orange autumn colors all year round. Very adorable outfit. Gnome-in-a-box?! Are you kidding me!? You're the best. That cardi is amazing. Totally looks vintage. I love your heels too! Great outfit all-around (like always)! Someone gave it to me a few years ago for my birthday and since then I'm just in love with his draws! ahahham Gnomes! I perhaps should collect flamingos, I mean being in FL and all. that sweater would look so cute with jeans too...lovely! Cuuuute! Have you heard about the movie coming out? Gnomeo and juliett?? Sounds adorable! Kallie you look so sweet! lol we both have that sweater! DUDE. My brother did the same thing. He had like 12 gnomes in his room at once. I need to take a picture of the giant one in Oak Park MI for you in the Spring. It is awesome and you would love it. Haha for unknown reasons, I love gnomes as well!! They're such great little guys. Red skirt and orange tights? that's such a fly combination!!! Looking forward to seeing your collection. Have a great weekend! The sweater and skirt look so pretty together. Love it!! that cardigan is so so lovely! I like your blog and this outfit is just awesome! Tu es très jolie ! I feel that this outfit is so u =) great!